There is a lot more to building a strong core than just doing sit-up after sit-up! The core is predominantly made up of the abdominals, obliques, hip flexors and the lower back, so it is important to train all of these main parts affectively and evenly. Whenever a person attempts to lift something, or simply moves from one position to another in their day-to-day life, the core is the first area that is used. This means your core is in use almost all of the time! And the more difficult the movement is, e.g. lifting, the more of the core you use. 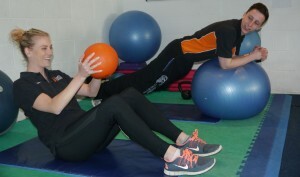 Core stability is also the key to good posture, and helps to ensure that your body is in correct alignment, which in turn helps to keep you injury free. In addition, having a strong core provides the lower back with much needed support, keeping those nagging lower back problems at bay that many office workers experience. And don’t forget – having that toned core also looks very good too! If you are not sure about how to affectively train your core, then get in touch with one of the gym team and we will gladly help to get your core toned and into shape! And reeeelaaaaax! Phew, those abs BURN! Keep an eye on our website too as we shall soon be announcing the start of Les Mills CXWorx, a brand new class to add to The Holbrook Club studio timetable.